The Son of God is born in the poverty of a stable in the town of David, received by the love of the humble Holy Spouses, and adored by poor shepherds. With the Holy Spouses witness how the poverty of the Nativity only serves the more to appreciate God’s infinite love poured out for us through the birth of his Son. 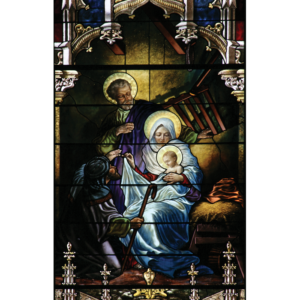 With Mary, Joseph, and the shepherds experience the great joy of Emmanuel, God-with-us. With them adore your Savior, Christ the Lord. Mary, full of grace, and Joseph, son of David; honor to you, Mother of God, and to you, guardian of the Redeemer. Eternal praise to the child with whom you formed a family, Jesus Emmanuel.